Most researchers believe that ulcerative colitis is an auto-immune disease. Your body has got a defense mechanism that protects it from harmful viruses and bacteria. The response body develops for fighting foreign materials is called inflammation. But in ulcerative colitis the inflammatory response, once triggered, doesn’t turn off even after bacteria and viruses are destroyed. 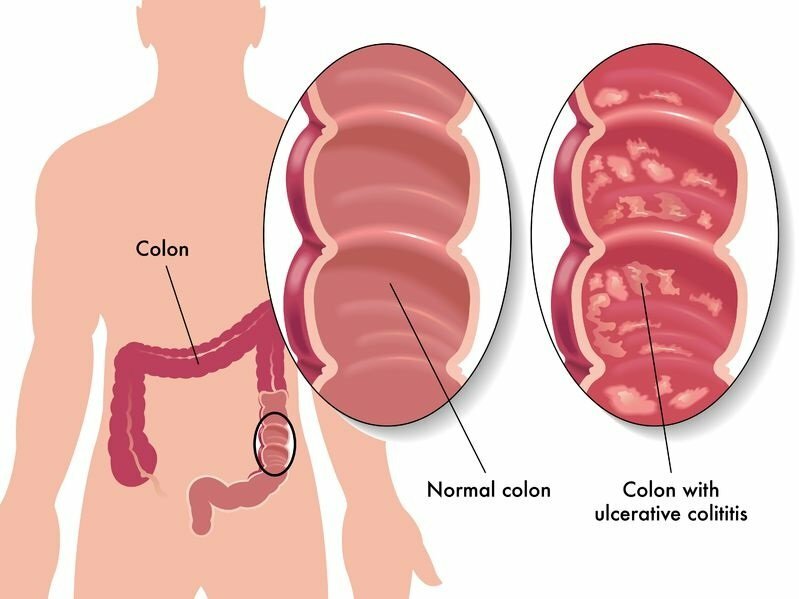 This causes excessive damage to colon and ulcerative colitis as a result. Some hypotheses propose that body starts an exaggerated inflammatory response against good bacteria living in our gut. The result of which is ulcerative colitis. Studies have shown that there is a strong relationship between ulcerative colitis and genetics. This disease tends to run in families. Studies have shown that 1 in 6 people suffering from ulcerative colitis have someone in their families suffering from same condition. Environmental factors also contribute a great deal in the development of this disease. High level of pollutants in environment and eating a diet rich in carbohydrates and fats increase the risk of developing ulcerative colitis. Pain in the abdomen or abdominal cramping. Your stool might contain pus or blood in it. Abdominal sounds are heard, which are splashing or gurgling in character. The frequency and urgency of defecation increases i.e. diarrhea. You might also experience some generalized symptoms like fever, weight loss and pain upon defecation (tenesmus). Arthralgia i.e. pain and swelling in the joints. Ulcers on skin or in mouth. A feeling of being nauseate all the times. You might also experience vomiting. In children, the growth is usually retarded. 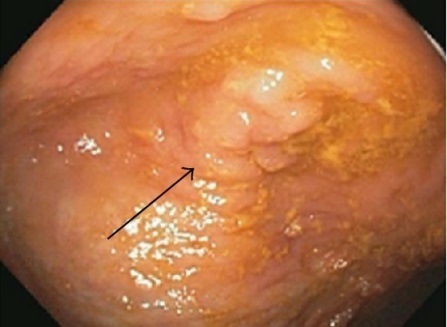 The first thing that can help diagnose ulcerative colitis is the characteristic clinical findings including blood in the stool, tenesmus and diarrhea. Fever, a generalized feeling of being unwell and weight loss indicates severe attacks. Blood tests are also valuable because a complete evaluation of blood profile might show signs like leucocytosis (increased number of white blood cells), thrombocytosis (increased number of blood clotting cells), iron deficiency anemia and elevated level of C-reactive proteins. ESR (erythrocyte sedimentation rate) is usually elevated. Colonoscopy provides a definite clinical picture. This procedure shows the inside of colon and characteristic findings of ulcerative colitis including mucosal ulceration, spontaneous bleeding and poor colon health. Now we come to the big question here, what treatment options do you have when it comes to ulcerative colitis? Well, the treatment options include use of medicines, some dietary interventions, stress management and surgery. All these treatment options are discussed in detail in this section. Don’t over eat. Avoid eating 1-2 large meals. Instead eat small amount of food throughout the day. Drink ample water throughout the day. If you’ve lactose intolerance in addition to ulcerative colitis, then its best that you limit the intake of dairy products because eating these products will worsen your abdominal cramping. Avoid eating food that is rich in fats (butter, cream, oily chip and hamburgers). Avoid food that is high in fiber as it can worsen your diarrhea. Such food includes seeds, barns, popcorn and nuts. Mesalamine or sulfazine (5-aminosalicylate) is the most important medicine when it comes to ulcerative colitis. It helps limit the symptoms of this disease. Since this is an auto-immune disease, some immunomodulators are also used in its treatment. Such drugs include azathioprine and 6-mercaptopurine. Corticosteroids suppress the exaggerated immune responses in the body and are a useful tool in the treatment of ulcerative colitis. Corticosteroids that are used in the treatment of this disease include prednisone and methylprednisone. Some monoclonal antibodies like inflximab are also used for the treatment of ulcerative colitis. There is a strong link between stress and ulcerative colitis. If you’re stressed due to some reason and this stress is chronic then you’re a more prone to develop this condition. Or if you already have this condition and you’re stressed all the times then it’ll further complicate your condition. Stress management has proved to be effective in the treatment of ulcerative colitis. Anything that can help you reduce your stress can help you reduce the symptoms of ulcerative colitis as well. Stress relieving techniques include yoga and meditation. The dietary or medicinal interventions are not giving desired results. There is a risk that inflammation might progress to cancer of colon. Serious complications like intense bleeding and rupture of colon occurs.